Lightweight material saved end user money because installation costs were lower than steel products. Properties of FRP are resistant to the elements and will not rust and rot like other traditional materials such as steel and wood. Little maintenance required - no repainting, minimal fading in sunny environment, and will not need to be replaced every few years. The goal of this project was to create a sunscreen to filter the harsh Texas sun and provide shade during the long summer months. The look for the sunscreen was to be high-tech, and industrial. 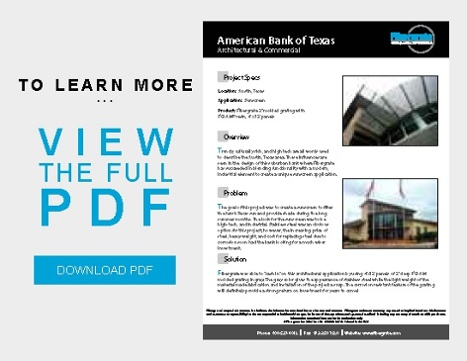 Stainless steel was an obvious option for this project; however, the increasing price of steel, heavy weight, and cost for replacing steel due to corrosion soon had the bank looking for a much wiser investment. Fibergrate was able to "cash in" on this architectural application by using 4'x12' panels of 2" deep FGI-AM® molded grating in gray. The gray color gives the appearance of stainless steel while the light weight of the material made fabrication and installation of the project a snap. The corrosion resistant feature of the FRP grating will definitely provide a strong return on investment for years to come!